"Fans cheer under a sunset as Pedro Alvarez #24 of the Baltimore Orioles rounds the bases after hitting a two run home run against the New York Yankees during the second inning at Oriole Park at Camden Yards on September 2, 2016 in Baltimore, Maryland." One can never get comfortable, because when you're covering what you think is simply another regular season game in a familiar ballpark, things will change. 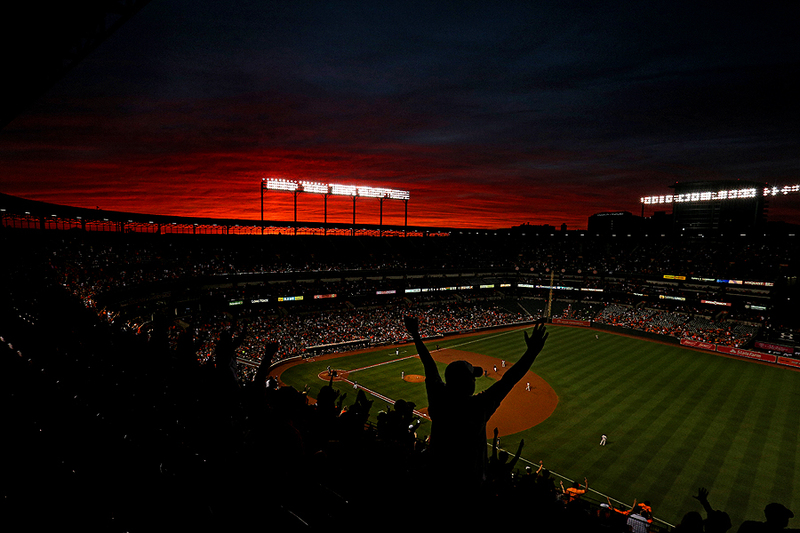 The other night as the New York Yankees took on the Baltimore Orioles the sky began to change. A very small hint of beautiful clouds began casting over the stadium. So I decided I needed to get to a higher vantage point looking west. A gamble to step away from a high scoring affair very early in the game, getting to the upper deck proved to be the best spot. After working what was probably a more magical scene, I camped out behind some fans hoping for a reaction. With a sliver of orange sky still showing, Pedro Alvarez belted a two run home run that got fans out of their seats. A great view, celebration indeed for birds fans.